This page looks at the use of the Metropolitan Police to manage the threat of Chartism outside the capital. It mostly focuses on the memoirs of one officer despatched to arrest Joseph Rayner Stephens and names 60 officers sent to Birmingham in 1838 to deal with rioting. Modern policing was in its infancy when the first wave of Chartism swept the country, and few towns outside London had a force capable of dealing with public order matters, let alone carrying out the sort of detective work that the Bow Street Runners had pioneered. As a result, the Metropolitan Police, founded in 1829, were called on to help out in other parts of the country. In 1837, for example, the Home Secretary, Lord John Russell, had instructed the commissioners of police to send a sergeant and 11 constables to Huddersfield to keep order during an election in which the radical Tory Richard Oastler was playing an active part. During 1838, a total of 647 constables were despatched around the country to prevent public disorder. The most infamous of these occasions was when a detachment of metropolitan policemen were sent to Birmingham that summer to suppress disorder associated with the first Chartist Convention, which had been moved there from London. This resulted in the arrest and imprisonment of the secretary to the Convention, William Lovett. The government remained reliant on the deployment of the army to ensure public order throughout the Chartist period, but over the next few years, modern policing would spread throughout the country as newly incorporated towns established their own police forces. Perhaps in part the creation of a civilian force of this sort explains why there was no repeat of the Peterloo Massacre during the Chartist era. However, policing would come close to being overwhelmed in the final phase of Chartism as a mass movement in 1848. In the panic that gripped the government and ruling classes that year, as many as 85,000 special constables were sworn in to aid the police, and thousands of soldiers were deployed across the capital. If policing was emerging in a more professional form, it had yet to develop the confidence to deal with public order matters without military back-up. In December 1838, the former Bow Street Runner Henry Goddard was sent north to keep an eye on the Chartist torchlight meetings taking place in Leigh, Bury, Todmorden and Ashton under Lyne. While there, he was called on to arrest the prominent Chartist leader Joseph Rayner Stephens. In this account, he explains how the magistrates’ decision to take Stephens into custody was put into action. A discussion took place as to the best means to be adopted how it was to be executed without the sacrifice of human life. It required great caution, as there were some thousands of spinners who would rise to a man and come forward to resist his lawful apprehension. Under the circumstances it would not be considered safe to attempt it without the aid of Military power, inasmuch as Stephens was so idolized and worship’d by all the operatives that there was not a family in all Ashton and other places but had got his portrait manufactured on all their tea cups, basis, plates and saucers, he was held in such high esteem among them. At this moment, the Church clock tolled the quarters and the clock struck the hour of one. The several Magistrates looked at their watches and on replacing them in their pockets one of them, Mr James Jowett, said he thought they had better adjourn the court for luncheon till two o’clock and they would on their return reconsider what was best to be done. The motion was agreed to. In less than ten minutes afterwards, while Mr Owen, the Chief Constable, Shackell and myself were looking over a wall in the Churchyard towards the direction of Dukinfield, we saw in the distance to our great surprise the Revd R Stephens advancing towards us, upon which we separated and hid ourselves from his view. I concealed myself in the Porch of the Church until he passed, making his way down Stamford Street in the direction towards Manchester . I followed him in the distance, Owen and Shackell by the same rule, following me for a full half mile. Stephens never looked back but crossed the road, and I could see that he was making up to a house. I hastened my pace and saw him knock at the door, and as it was opened I was close behind him and in the passage. I told him who I was an had got a Warrant for his apprehension; we walked into the parlour, and by this time Owen and Shackell arrived. When I explained to him my business he wished to see the Warrant, to which I gave consent. He made an observation to the effect that he ought to consider himself highly honoured by Lord John Russel (the Home Secretary) in sending such a person. “But where are you going to take me to?” he asked. I replied that I could not consistently do so, but that he could write a note to his wife and I would see that a messenger should take it at once. This was consented top, and while he was writing, I slipped out the back way leaving him in custody of Owen and Shackell, while I ran to the Commercial Hotel and obtained a Post Chaise which got to the door just as Stephens had finished his letter. This was no sooner done when the Landlady promised its safe delivery. This done, Shackell stepped into the Post Chaise, followed by Stephens and myself, while Owen mounted on to the Splinter-bar, so away we went. At length we arrived at Manchester and stayed a few minutes at the hotel for refreshment. As we were retiring from the refreshment room I was met by a Magistrate, who express’d himself that it was desirable that the soldiers should be called out. I was astonished to see so many people gathered together in so short a space of time all round the post-chaise, on the foot pavement and up the steps to the entrance of the hotel, some enquiring what was the matter and what it was all about, so that we had considerable difficulty in pushing our way through the crowed to get into the Chaise. After being seated the postillion drove away with all speed to Worsley. To resume my narrative – What the Magistrates said or did after their return from luncheon to the Court at 2 o’clock I am unable to say, for the Capture I made was so unexpected and sudden that I had not the time to inform them. On our arrival at Worsley I reported myself to Lord Francis Egerton, who said he was not able to go into the case himself without forming a Bench of Magistrates and that I had better hire a post-chaise and find Mr Smith the Magistrate’s clerk, and he Magistrates who granted the Warrant. This I found to be no easy task, with the uncertainty of finding them at home. 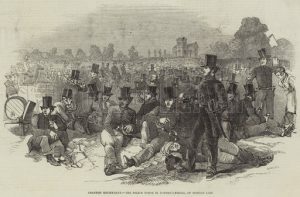 After going a distance of about thirty miles to Leigh and other places, I succeeded in returning to Worsley about 9 o’clock at night, when I found the place where the Magistrates held their meeting to be surrounded by a body of Dragoon Guards about 40 in number, commanded I think by Colonel Weimess. The Magistrates after sitting till midnight committed the prisoner under remand and Owen, Shackell, the prisoner and myself were escorted by the mounted Dragoons, flourishing their bright drawn sabres under a brilliant moonlight, which, together with the hoar frost upon the ground with the tramping sound of horses’ hoofs on the frozen icy road, produced a very novel effect. On our arrival at the New Bailey Prison, Manchester , about 1am, the Bell was loudly rung, and after waiting nearly a quarter of an hour the strong gate was opened. The Governor appeared with two of his warders, each carrying lanterns, who, on seeing a post chaise conveyed by so strong a Military guard with drawn sabres formed in a line before the prison gates and with the smoke arising from the horses, wondered what it could be all about at such a late hour in the night. On explaining my business I delivered over to him the prisoner with the commitment to be dealt with for further examination, which occupied the two following days, viz the 27 th and 28 th December, 1838. Then he was again remanded until the 3 rd of January, and after a lengthy examination was committed for trial or to find bail himself in £1,000 and two sureties of £500 each. Source: Memoirs of a Bow Street Runner, by Henry Goddard, (Museum Press, 1956). Joseph Rayner Stephens was later found guilty and sentenced to 18 months in the County Gaol at Chester . He was still there in late 1840, when the inspectors of prisons drew up a remarkable report on the condition of political offenders in prisons. Stephens died in 1879 and was buried in St John’s Cemetery, Dukinfield. Metropolitan Police officers sent to Birmingham to police the Chartist Convention and disturbances in the town, 4-21 July 1838. Payments ranged from £17 0s 0d for the superintendent and inspectors, to between £4 5s 0d and £4 19s 0d for the others. Some were there 10 days, others for 17.